As Oregon transportation leaders consider tolling Interstate 5 and I-205 in the Portland area, a recently filed initiative petition threatens to upend their plans. And surveys commissioned by the Oregon Department of Transportation say the proposed measure most likely would pass if it qualified for the ballot. The Oregon Transportation Commission that oversees ODOT will discuss tolling at its Aug. 16 and 17 meetings. As directed by the 2017 Oregon Legislature, the commission must submit a proposal to the Federal Highway Administration by the end of the year to toll parts or all of the freeways. The Legislature says that if the federal agency approves the proposal, ODOT must implement it, regardless of what the public thinks. But the initiative filed on July 27 says such tolling on existing freeways must be authorized at a statewide election, and must be approved in each of the counties where tolls would be imposed. If it attracts enough signatures, the measure will go to voters in 2020, years before the department can impose any such tolls. As part of the transportation commission's work, ODOT commissioned an online DHM Research study that was conducted in Multnomah, Washington, Clackamas and Clark counties in December 2017. It found that only 22.5 percent of residents in all four counties are willing to pay a toll weekly or more often. The largest block lived in Clackamas County, but it was still only 26 percent of all residents. Slightly more — 31 percent — agree ODOT should explore multiple options for encouraging people to alter their transportation choices, including tolling. Even if the initiative passes, there's still a way tolls could be imposed without voter approval. No vote is required if the tolls are used to pay for "new net capacity" on the road or bridge on which the toll is assessed — something the survey says more residents support. Asked what they would like officials to do about congestion, 51 percent chose expand and improve freeways. An additional 14 percent picked expand and improve highways. Only 3 percent said add tolls in Oregon to and from Washington. Ironically, the Legislature intended the tolls to solve a problem that a majority of survey respondents agree is serious — traffic congestion on Portland-area freeways. Legislators believe tolls will reduce congestion, especially if they increase at peak travel times, a concept known as congestion pricing and value pricing. The 2017 transportation funding package that directed the transportation commission to make the proposal also dedicated the revenue to congestion-relief projects in the Portland area, such as expanding the I-5/I-84 interchanges in the Rose Quarter and adding a third travel lane on I-205 between Stafford Road and Oregon City, including on the Abernethy Bridge. 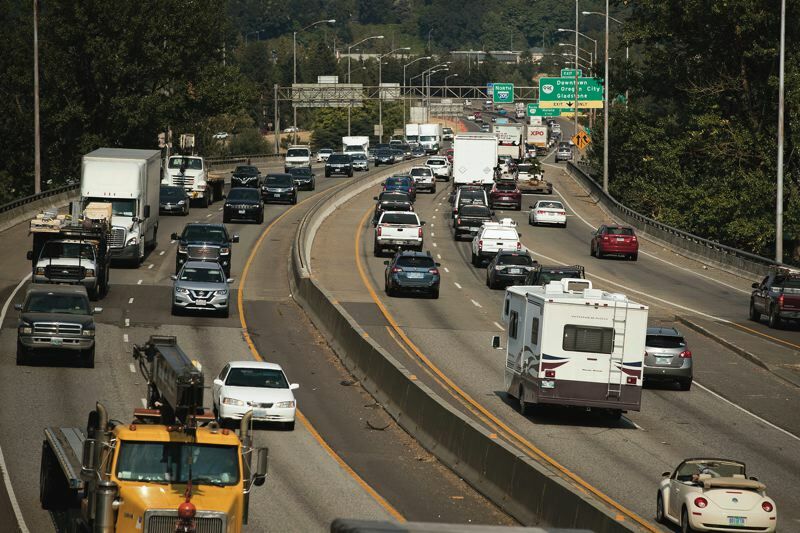 The vast majority of survey respondents — 81 percent — believe congestion is a serious problem on both I-5 and I-205. Those who agree range from 76 percent in Multnomah County to 91 percent in Clark County. Public perception of the problem is widespread. Although 80 percent of those who commute on I-5 and I-205 believe congestion is a problem, 90 percent of noncommuters think so, too. Those over 55 are slightly more likely to believe congestion is a problem, even though they commute less than younger residents. Regular commuters also are more willing to pay tolls than noncommuters. So are those who have experienced toll roads before. But they still represent a minority of all respondents. The Tolls Need Voter Approval initiative was filed by Gladstone Planning Commissioner Les Poole, state Rep. Mike Nearman, R-Independence, and state Rep. Julie Parrish, R-West Linn. Parrish has a political consulting firm that referred a statewide health care measure to the Jan. 23, 2018, special election ballot, where it was defeated.